Sometimes people are curious about where we got our company name. It really has two stories to it. 1) Our writer extraordinaire (Chris Jones) and I way back in the late 90s’ as the internet boomed were looking for a collective place to house our ‘musings’ and ‘creative writing.’ Thus was born the Studios. 2) As a kid I was really into WWII history – especially Aviation history – so when the other guy mentioned “Bombshell” I glocked onto it like a kid in a candy store. Especially the history of aviation. So if you’ve never seen, or don’t know about, Aircraft pinup art, here’s a brief lesson. Wiki article on Bombshell Nose Art. SSGT Ken Bergmann, USAF, photographer. Memphis Belle” nose art on a C-141 Starlifter from the 164th Airlift Wing, 155th Airlift Squadron, Tennessee Air National Guard, taken while at Naval Air Station, Sigonella, Italy. 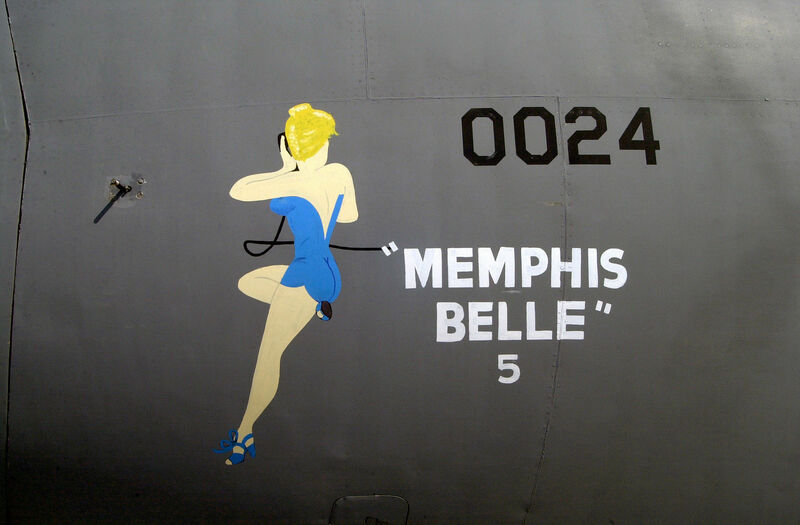 This nose art honors the B-17F “Memphis Belle” of World War II. This Lockheed C-141 Starlifter (AF Serial Number 67-0024) is known as Memphis Belle V.